AJ: Sensei, I understand that you began aikido after entering Waseda University? Tada Sensei: Yes, but because of the war I was unable to enroll in the dojo until March of 1950. Actually, I didn’t do that much karate, although I do hold a dan ranking. 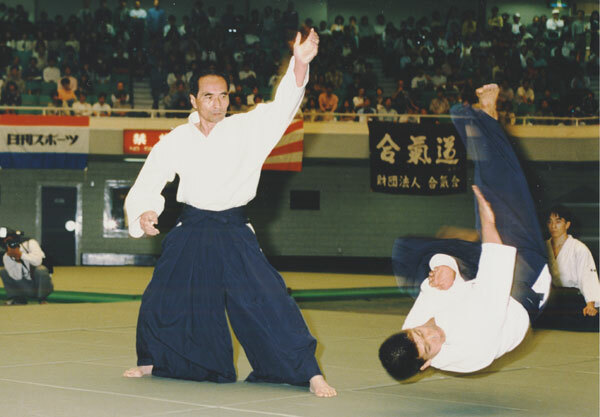 At first I was practicing both arts, but I began spending more time practicing aikido, and it became impossible to do both. It wasn’t that I thought one was better than the other, but rather that I admired Morihei Ueshiba Sensei greatly. I had known him through my father since I was a boy. In 1942, I was in Shinkyo (present-day Chang Chun, Manchuria), but I just missed Ueshiba Sensei’s performance at the famous Kenkoku University Tenth Anniversary Martial Arts Demonstration. My cousin, who is one year older than me, told me it was a fantastic demonstration. Apparently hardly anyone could take Ueshiba Sensei’s ukemi. They weren’t just being thrown, it was if they were being shocked by high-voltage electricity. In issue number four of Aikido Tankyu [a periodical published by the Aikikai Hombu Dojo], you wrote that you were very surprised and impressed by Ueshiba Sensei’s unusual way of thinking. When I enrolled in the dojo I was twenty years old, and Sensei was sixty-seven or so, a difference of about forty-seven years. But he threw me so easily no matter how strongly I attacked, that there seemed, in that respect, to be no difference in our ages at all. Looking back on it now it seems perfectly understandable, of course. In any case, he had a unique air about him and he was filled with an unusual energy. I felt I had met a true martial arts expert.